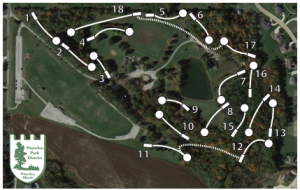 An 18 hole Disc Golf course was added in Konarcik Park in July of 2015. All Park facilities are open from dawn until dusk from April through October, except for the Skate Park which is open from 9:00 am to 9:00 pm year round. The Park District Board meets the 2nd Wednesday of every month at 7:00 PM at the Waterloo City Hall. To contact the Park Board by e-mail send a message to the contact@waterlooparkdistrict.org address.